During the month of May, three of Colombia’s top media with the highest circulation and exposure each dedicated articles to promoting Mexico’s Pacific Treasure to thousands of readers in South America. May was rife with articles published in top Colombian media as a direct result of the public relations efforts the Riviera Nayarit Convention and Visitors Bureau has accomplished in this emerging market. Colombian dailies El Espectador and El País, as well as Hola magazine, whose readers are at the top of the socioeconomic ladder, showcased the wonders of Mexico’s Pacific Treasure, highlighting its attractions to its domestic market and beyond. Hola magazine has a bi-weekly publication of 138 thousand issues, publishing topics ranging from celebrity news to fashion, beauty and lifestyle articles. It’s known for its ample photographic spreads. 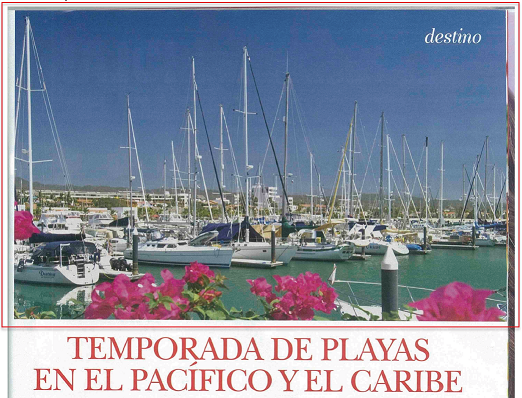 On this occasion, the magazine’s cover featured a picture of the Marina Riviera Nayarit for the article, “Temporada de playas en El Pacífico y El Caribe” (“Beach Season in the Caribbean and the Pacific”). El Espectador published “La danza del mar” (“The Dance of the Sea”) within its tourism section titled Buen Viaje (Bon Voyage), which includes a description of the mating rituals of the humpback whale along the coast of the Riviera Nayarit. It also highlighted the charms of the 23 towns that make up the destination, as well as the attractions of the mountain and its endemic and migratory flocks. This medium prints 50 thousand issues with a domestic circulation. El País was founded in 1950 and is distributed throughout the Southern Cone countries thanks to its membership in the Periódicos Asociados Latinoamérica (Associated Newspapers of Latin America). Its issues have approximately 83 thousand readers on a daily basis; the online edition has an average of 2 million 800 thousand visitors a month. El País dedicated a column to the Riviera Nayarit Salsa Mambo Fest, presenting the destination during the event where professional dancers from Cali took part. Thanks to its infrastructure, its natural bounty and the capacity to organize and host large events, there’s no doubt the Riviera Nayarit has much to offer. Colombia is getting to know more and more about the destination, awakening an interest in potential tourists to visit the destination.